The UNISWA Titans with the MNRL trophyThe UNISWA Titans were crowned the MNRL 2014/2015 champions after beating big rivals the Eagles on Saturday. The last game of the MNRL season was to be the decider for both clubs. The winner of the final game wwould lift the MNRL trophy and it was the Titans who took the honours. The Swaziland Rugby Unions Presidents Select narrowly missed hitting the 100 mark in their 98-0 defeat of Carolina over the weekend. Rugby Union President Michael Collinson said he was very surprised when he was told the score; the highest score recorded by a Swaziland side was 76-12 against Komatipoort eight years ago, but 98-0! The side has been training hard on fitness and I was told this played a huge part. The team must be praised for their efforts and special praise and thanks goes to team Captain Mark Pocock for all his commitment in preparing the whole squad. Back row. 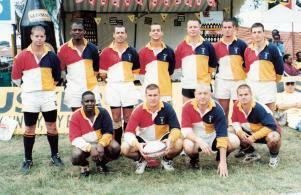 Bud Takis, Mark Pocock, Stef Jordaan, Sean Fitzpatrick, Bru Von Wissell, Hound Da Sousa, Dez Takis (capt) Front row. Swaz Dlamini, Bushy Way, Baz Takis, Pedge Martin, Pug Martin. The Swazi 7s side returned from the Kenya Safari 7s seeded 6th in Sub Saharan Africa. The tournament for the seeding was run with the Safari 7s and funded by the Confederation of African Rugby. After a tough tournament held over three days. Kenya came out on top seeded number one. Surprise team of the tournament were Madagascar giving South Africa and visiting team Samoa a run for thier money. The Swaziland Rugby Union participated in it's first Rugby World Cup 7s tournament in Nairobi Kenya. The Swazi 7's squad returned from the Commonwealth Games held in Kuala Lumpur Malaysia having played some of the top rugby 7's teams in the world. The Swaziland Rugby Union played it's first test match after joining the IRB and delivered a crushing defeat to the Botswana "Vultures" on thier own turf. Team. L/R Backrow. B. Maynard, M. Dlamini, G. Wickett, D. Jones, G. Shields, L. Von Wissell, M. Nann. Frontrow. H. Murinda, R. Oostergettal (capt) M. Collinson (coach) J. Plank.